Das Hostel war hervorragend. Es gibt nichts zu bemängeln. Super nette Mitarbeiter die sehr hilfsbereit sind, super leckeres Frühstück und die Zimmer waren bequem, modern und sauber. What an awesome hostel. Not sure if I've ever been to a better one before. 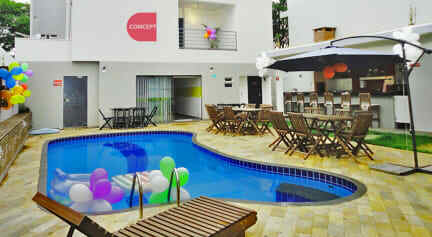 Amazing breakfast, everything clean and modern, comfortable beds and good aircon. Staff is also really nice, especially Marco who tries to help you with everything. Woult def come back! Very clean, modern and comfortable hostel. Good choice of breakfast. Welcoming and friendly staff. We slept in a 8 bed dorm and had lots of space for luggage. Beds were comfortable. Would go there again anytime. The hostel is licated next to the bus station connected to the falls. Everything is easy to find. The stuff is super friendly an helpful. I made many friends in the hostel. This is a great hostel, super clean and modern. The staff is very friendly and helpful and especially the breakfast was very good, we missed nothing. And I really liked that everybody gets a key for an own locker in the dorm. I would definetely recommend this hostel. The location was good too, because it is not to far from the national park. There are no clubs or bars near by, but thats okay because we only came to visit the national park. We liked the spacious rooms, everything was clean and nicely designed. We were not that happy about the athmosphere as there were mostly no typical backpackers. Also the music in the relaxing area was quite annoying and the AC was way too noisy and Cold. It feels more like staying in a hotel then in a hostel. The staff is very friendly and helpful. Unfortunatelly there were mostly portuguese speaking guests so I felt a little lonely because there was not the chance for a good conversation... But the hostel can't be blamed for it. If you come alone and you want to meet people, this is not the right place for you. If you just want to have a place to sleep, this is a good place because it's very quiet and clean.